This article was originally published in the Huntsville Grotto Newsletter, No 60, February 2018. Please note that Montague Cave is located on private property and visitation is not generally available to the public. Additionally, Russell Cave is a closed cave, listed as a National Monument, and has sensitive archeological areas. Jason and I stumbled onto Montague Cave by chance. Its gaping black maw beckoned to us from the sliding back door every time we visited Andy Zellner at his caving home, the Humble Abode. With a large walk-in entrance and relatively easy cave for the first couple thousand feet, it became one of those caves that you get used to, but quickly slips into obscurity as a short cave with very little to offer. However, one part of the cave continued to intrigue us, the sump. When we first talked to Andy about the sump, he informed us that Jim Smith surveyed the cave many years before and dove the sump at the time. There was some verbal confusion in the conversation, as we assumed that Jim dove the upstream sump toward Russell Cave when, in fact, he actually dove the downstream sump, which leads out of the cave through a series of short sumps to Cooper Spring. Rumor had it that he attempted a dive in the upstream sump, a murky green pool on the side of the trunk passage, but there were equipment issues, and no real progress was realized. The distance was only about 1,500 feet (straight line) from this sump to the nearest passage in Russell Cave, but what plagued us was the visibility. Time and time again, when we had dive gear with us, rain would inundate the valley and the sump turbidity would shoot through the roof and take weeks to clear up. When we didn't have our dive gear, the sump would be crystal clear. We just needed the two things to align. The last TAG Fall Cave-In (2017) provided us with gorgeous weather and the best chance to dive since we first visited Montague Cave. No rain for weeks made the sump semi-clear and doable. A group of TAG divers exploring some of the other springs in the area were roped into the project when Jason suggested they stop at Andy's and "check out" the sump before heading back to the TAG site. Jason, Marbry Hardin, Terry Hall, Joshua Shouse, Chris Garguilo, and Forrest Wilson gathered up some heavy gear bags and headed into the cave. Though relatively short, the trip back to the upstream sump wasn't easy. Montague receives most of the drainage of the cow pasture and the Russell Cave Watershed, completely flooding it almost to the roof, creating high, slippery mud banks. It also brings in trash and other questionable debris which collects in a smelly, trash compactor-esque mess at the downstream sump. The thin, super slippery mud makes walking in the passage difficult with heavy bags. High mud slopes lining the deep river sections give an unpleasant choice, a slippery crouching crab crawl above, or chest-deep wading in cow poop water below. Even crawling can be treacherous, when boots fail to find purchase and the caver starts sliding toward the dark water below. After the second slip into the river for Marbry, he gave up and stayed wet. Once at the sump, the water was oddly clear with no flow, despite the distinctly black water pooling in the main passage before the sump. In low water conditions, the two waters are separated by a few hundred feet of passage. The water that runs into the cave from the Montague entrance pools and turns tannic and fetid, but something else is happening at the sump in the middle. This water is not the same water that is entering from the Montague entrance, and must be coming from Russell Cave. But how the water remains clearer is not immediately obvious. The water does not seem to flow out of the middle sump into Montague cave, but instead bypasses the main cave altogether. Where is all the water going? The sump dive begins as they all do, a shuffling of gear with the diver(s) at the beach, and the porters trying to find a nice warm place to hang out and wait in the dark, hoping the diver will eventually come back. Having never really taken a closer look at this area of the cave, Jason was surprised to find a tall narrow canyon perpendicular to the Montague trunk passage, which he follows to what appears to be a narrow pinching end at the water level. This is confusing, as there must be some sort of going passage, even if it is very small, to allow the water level in this pool to change, and to deposit the bank of sand that collects out in the main passage. The low visibility, around 4 feet, even with powerful dive lights to cut through the green murk doesn't give up any secrets, and Jason is initially confused about the location of the going passage. This time, instead of floating along the surface, looking for a ceiling indention that would indicate a going passage, Jason submerges, and follows the wall as it intersects the floor. Before long, the floor dropped in depth, and the solid ceiling arched overhead, blocking access to the air above. As it became apparent that Jason was actually in a passage, the reel began humming as the exploration line spooled off of it, Jason swimming at a slow 50 foot per minute pace, looking for places to tie off the line preventing it from being ripped out in higher flow. The visibility increases slightly, to just over a body length, showing that the passage is fairly low and wide, but generally uniform in shape. This makes progress easy, and fails to reveal any side passages, at least on the side of the passage he is placing the line; the poor visibility prevents him from seeing the other side of the wide passage. Eventually, the fun comes to an end as he reaches the last knot on the exploration reel, which he ties off on the wall, leaving a line arrow with his initials, indicating the way out, and who had been there. Upon returning and entering the survey data from the dive into the survey software, with some surprise he realizes that he did not go upstream toward Russell. In fact, the new passage appears to parallel the existing dry cave, leading further away from Russell Cave, and toward the terminal sumps where Jim Smith dove many years ago. 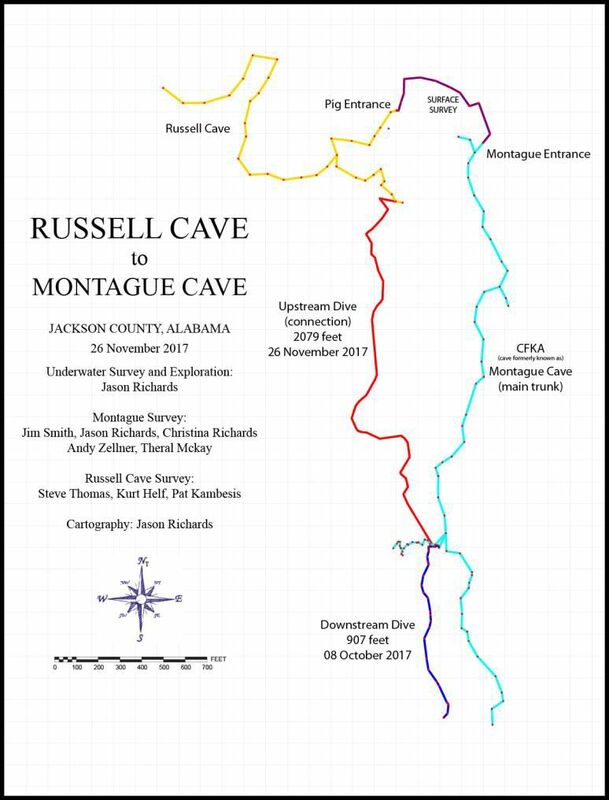 But there is no mention of an upstream sump from Jim's data or communications, nor is there another spring on the surface where the water might emerge separate from the known downstream water coming from Montague Cave. We finally realize that the cave has two parallel downstream passages. It is still unclear where this water eventually leads—if it might join underwater with Jim's sumps further down, or if it is a completely separate downstream cave. That night, the rains begin, and within hours, the raging waters entering Montague Cave are almost to the roof—creating a powerful flood that is sure to rip out all of the existing new dive line. Any efforts to continue exploration this weekend were over. In November of 2017, we notice that the weather was again cooperating and there might be another chance to dive the sump. On the 23rd, we coerce Andy Zellner, Liz and Ryan Hoffman, Grace Baumann, and Brian Killingbeck to carry gear into the cave. The line that Jason used for the last dive is hanging tattered and torn from the huge flood of water and debris that went through the cave immediately after the last dive. With some inspection, it is apparent that there is some flow on the opposite side of the perpendicular canyon—on the side that Jason didn't see any passage from the surface. It is apparent now that this is a completely separate upstream/downstream passage, which only connects to Montague cave through this narrow perpendicular canyon. I re-tie his line to the original station used on the last dive and set the reel so he can reach it. Jason gears up in his KISS sidewinder rebreather. The sidewinder is a new type of rebreather designed to work in very low caves. In addition to being small in size, it breaks down into several manageable parts so porters don't have to complain too much about carrying it into the cave. Despite all of this, Jason carried it all in one piece through the slimy mud approach. He tells me his estimated time in the sump is 1.5 hours, as our revised estimate is about 1,800 feet between the Montague sump, and Pat Kambesis' last station in Russell Cave, but he doesn't think it'll take that long. After gearing up, he slides off into the murky water, his light slowly fading in the distance. After entering the perpendicular canyon, I was surprised to find that the remains of my dive line were still here, away from the main flow of Montague Cave—this is good to know, that even during such an extreme flood, the lines will most likely remain in this portion of the cave. I come to the area where we saw flow and a slight boil from above, and marvel for a minute at how I managed to miss this, followed by how I managed to end up going in exactly the wrong direction. There is a little wide spot in the canyon here, wider down here at the water, than up above in the canyon where the other cavers peer down at me straddling across, and perching on the narrow shelves, so it makes sense that the water has carved this little room out some. I guide the new line to an initial tie off, to secure it from more floods, and submerge into the water. At first, the passage is still not obvious, but at about 6 feet, the ceiling begins to slope away, and the floor drops down a sand slope—the same slope that pushed the water up in the canyon creating a surface boil. The flow is almost insignificant, and I am hoping for a nice repeat of the downstream passage, with an almost straight, very easy to follow wall and a flat, boring floor. Ryan, Liz, and Andy go off to explore the upper part of the cave, while Grace and Brian leave the cave. I wait on the shoreline just in case something happens within the first 20 minutes to call the dive. After realizing that the dive is a go, I head out of the cave and grab a small shovel from Andy's place. I don't have time to do a lot of steps, but I'm trying to make the walk along the slippery muddy slopes less treacherous for people hauling gear. After about an hour of digging and maintenance. I head back to the sump expecting Jason to meet me at the shoreline. However, he is not there. So, I sit and wait. Eventually I hear voices and look to see Andy, Liz, and Ryan coming back from "fun time" in upper Montague. I'm nervous. Sometimes the waiting is the hardest part. This is the time when you think about what you will have to bring in to go rescue someone. Right away, it is apparent that this is going to be more challenging than the downstream dive. For one, I have a known distance, 1,800 feet, that I have to find all in one dive, as we don't know when it will be diveable again. Having a set goal like this is a less than ideal situation in cave diving, as divers, including me, tend to overlook issues in an attempt to complete the goal, often risking their lives in the process. And the overlooking begins immediately, as I realize I have somehow rigged my sidewinder incorrectly, trapping part of the counterlung and causing me to not be able to exhale fully without venting gas. This is going to make the rebreather MUCH less efficient. Regardless, if the water stays shallow, breathing in this "semi-closed" mode is still much more efficient than diving without the rebreather, and I would have enough gas in my two 50 cubic foot tanks to exit the cave without the rebreather, should that have to happen. Ignoring the silly breathing issues, I concentrate on finding the way through the flooded cave. Still limited by approximately 5 feet of visibility, I find that the cave is very wide—approximately 20 feet across, which I discover as I accidentally cross from the right wall to the left wall on occasion. In addition, there are a few large logs which must be circumnavigated. Not a problem, but it hinders easy navigation. The best bet is to generally follow a wall, but again, unlike the downstream, I see that the right wall occasionally has side grottoes, which I usually am able to identify, by being surprised by a right angle in the passage and then searching for the other side of the side passage entrance. They never go very far, but they do waste time. I'm using a new Light Monkey LED diving light—a huge progression from previous dive lights. In years past, dive lights were either relatively dim, or they had pencil-thin light beams, intended for the clear waters of Florida and Mexico. But that sort of light didn't help much in murky water—the only thing that helps is plenty of very bright light focused in one general direction, and this light does that job very well. Well enough that I am able to pick out ripples on the floor in the center of the passage to navigate. This is a common trick for me actually, in underwater cave with soft floors, (and river banks too, I'm sure) the higher flow is in the center of the passage, and it creates ripples in the floor material. As you get toward the edges of the passage, the flow slows down, and the ripples disappear, becoming a smooth soft bank of silt, clay or mud. By staying with the ripples, I can be sure that I am staying with the main flow of the water (sort of like staying with the air in dry cave, only much more obvious) and this helps me skip many distracting, but ultimately not helpful, side grottoes. Eventually the passage starts to make very large curving bends. The only way I can tell this in 5-foot visibility, is that the flow creates a large sand bank in the middle of the passage—pushing the sand up and then depositing it where the water slows down at the end of the curve. These always surprise me and doesn't always lead to good things—frequently these sand banks can hide major side passages; but in this case, the passage seems to continue, and I am able to cross the sand banks and move further into the cave. After a while, the first reels clicks to a stop, and I pause to tie the end of the line off to a small protrusion on the wall, then tie on my second reel. Normally, I would be elated at this, but I realize that there is a very real possibility that I will have to pull out my third reel, and so I may not even be 1/3 through the dive. With the second reel secured, I once again get into my rhythm, look for the ripples, watch a wall, make a tie off. Unfortunately, the places to make tie offs are getting few and further apart. This creates a problem in that if I make a very large run between tie offs, and at the same time, the cave begins to curve, the line can be dragged into the corner of the curve, and the passage there might not actually be large enough to get through. The real kicker is I wouldn't realize this until I was on the way back—and suddenly the line might wind into a very small crack, where I cannot follow it. This is, unfortunately, not an infrequent occurrence in low visibility sump exploration, and leads to much anguish as a safety line is deployed, the route around is eventually determined (the way that was originally swum on the way in) and the new line is re-established. Even though it maintains a continuous guideline to the surface, it makes one feel unsettled, as it is an indicator of things done wrong on the way in, or very difficult conditions. The cherry on the top is returning with the flow is usually done with worse visibility due to diver action and exhaust gas knocking soft matter off the roof of the cave. The line trap can be entered partially, and the diver stuck before they even realize it has happened. I continue, knowing in my mind that the very long stretches are the best I can do, as I did not bring the plastic stakes to secure the line in the deep sand. Every once in a while, I find a large enough rock on the floor to wrap the line around; occasionally it is a tiny eyelet in the ceiling. One time, it is a shoe. As the cave progresses, not much changes—still crossing the occasional sand bank and alternating between sides as the cave undulates. In time, the second reel snaps tight as the last of the line pulls off it. Now, I'm a little concerned. Just under 1,800 feet. There is no indication of surface debris on the floor, like I would have expected, with the Pig Entrance to Russell Cave being so close to the upstream sump. There have been some pretty major direction changes, and I'm beginning to wonder how much longer this cave will be. I only have one more reel with me, about 850 more feet. I'm watching my oxygen bottle pressure drop much faster than I expected due to the semi-closed method of breathing, and trying to maintain the right mix, (which ultimately was unnecessary) and the cave certainly isn't getting any smaller. Had I missed it? I was pretty sure that I had been able to see the ceiling all through the trip—I would have seen any silver-colored air bells. How big was the connection area in Russell? I had never gone to see it, perhaps it was a small room, dropping into water, similar to the perpendicular passage at Montague—I conceivably could have missed something like that, maybe? Regardless, I was getting close to 40 minutes—there was no way I was going to make my surface time for Chrissy. Nothing to be done—the cave continued, and so did I. With the exception of hopping over the five to six foot high sand banks, the cave had been solidly in the mid-twenties of feet in depth. As I reached the middle of my third reel, the floor begins to slope up, in what was obviously not another sand bank—the ripples continue up the slope. I kept a close watch on the ceiling, looking for the telltale silver of air above, and within a hundred feet, it appeared. I poked my head out, just enough to see the ceiling arching up away from me, and a wide, walking, river passage appeared ahead. I had made the connection. My excitement was tempered only by knowing that I was going to have to swim back and survey all of this line, and that someone had managed to put the last dry station just higher than I could reach to tie off the dive line. The return was ultimately uneventful. I get in a rhythm surveying as well, and before I knew it, (but much later than my anticipated return time) I was back in the friendly parallel canyon in Montague, the underwater video lights lighting up the sump pool, casting a dim green light over the entire room, and my beautiful wife waiting for me on the beach with all of our caving gear. At 40 minutes past his return time, I finally see a swish of light in the water and I tell myself that I knew he would be back. Jason finally emerges with two and a half empty reels and news that he made the connection.